So apparently the party planners forgot about International Unicorn Day. So its up to someone as great and powerful as myself to announce it. Who are your favorite Unicorns? Do Alicorns that were once Unicorns count? Lets share the great and powerful Trixie and all the other unicorns out there. Now that we are on the precipice of the show's ending Preci.. ? Threshold Ehm.. Brink? ... That the show is about to end. we managed to get an interview with Lauren Faust on her original vision for FIM. it will happen a few days after s9 ends and will be shown live at eqTV (there will be a link here don't worry you will not miss it) and it doesn't end here, it will be followed by an AMA by both Lauren and her good friend Tara Strong(twilight sparkle). please keep it respectable and if you have and Strong opinions Tara will be there to answer them, i can't stretch this enough, it is imperative that we don't screw this up so it will be heavily policed Impero.. impera... IMPORTANT! Ponies! Ponies! Ponies! That is all. Happy Season Premiere Day! Goodnight all. I wanna say thank you to all who spoke with me today and to all of those who speak with me regularly. And all of you who aren’t here to talk, I really wanna thank you all too. I love all of my friends and you all know who you are. Take care and see you all tomorrow. Much love from the rooster. I've been TwilySparky on here for many months now. I don't know if I want to get rid of this alias but I also don't want to be restricted to only using Twilight for the namesake. I like a lote more cute ponies and would like to use them as well. Maybe it's for the better if I just revert back to TheTaZe. What do you all think? Nice Now I need to get 111111. Yes, Twilight! It is Winter Wrap-Up! Luna wishes you all a good and happy evening. Blank Flank permissions have been altered to allow them to access profile pics, profile edit, and status updates. To prevent spammers and trolls for immediately slamming the site, they will be temporarily set to have their initial posts requiring approval. The moment the first post is approved by a staffer then the account is tagged as safe and the queue ends. Due to the historical issues with individuals coming back and ‘erasing’ content they have on MLPF, posts now have a time limit on the editing. The time limit is set to one month. I want to allow users to be able to edit ongoing discussions, but want to protect our historical conversations from being erased en masse as people leave the fandom and want to erase everything they posted here. We are currently evaluating additional perks for Subscribers. To start off the file size allowed for avatars has been increased from 150kB to 300kB. More is planned. They also have unlimited display name changes added to their perks. I am also going to be instituting a way of recognizing tenure on MLPF for users who have been a strong part of this community for a while. Rank badges are all well and good, but we need to find other ways to acknowledge our appreciation. Look for more information later. Sunset Flight with the butterflies! I would like to wish a Happy (Belated) Unicorn Day to my two favorite "Unicorns" who are voiced by Tara Strong, Princess Twilight Sparkle & Princess Unikitty! Twilight: When I said I wanted to fly, this is not what I had in mind! Good morning, my friends! May your day be wonderful Happy Haiku Day! I wish for at least one more Applejack song in season 9. T-this is too much! She's gonna give me a heart attack! Come on! Let's go see the Moon! *Looks at the "Brohoof" icon* Is Tempest Shadow our new hoof model? The embodiment of the Sun! It's always a bright and beautiful day when Tia is around! Hello, my dear ponies. Discord here and today is all about me. Chaos is allowed to reign within the rules Fluttershy has given me.... Anyhow be prepared for trivia, a rousing game of Ogres and Oubliettes, and some wackiness that even I can't predict. Be warned that a few of my clones are lose and some boooooring pony that runs events warned me about a Marlawson or Mama Lawson being on the loose or something like that I mean who cares when you get me all day? Well, I think this counts. 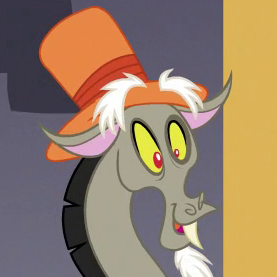 It's not much of a "draconequus", but I think it's certainly chimerical enough to satisfy Discord's sense of chaos. It's mostly pony with the tail of a scorpion, the claw of a crab, and what's supposed to be wings of a pegasus. I love Discord! Credit to @ChB for giving me this idea. *To the tune of MLP fandom song "Anthropology"* Twilight Sparkle is Best Pony, Rarity's a fashion star! Applejack's an apple farmer, d'ya like my list so far? Celestia is cool n'all, but Luna's Best Princess by far! It's real easy for me This Best Poneology! I seriously cannot believe that Friendship is Magic is going to have 200+ episodes when it's all over. What an incredible accomplishment. 30 minute exposure of the Whirlpool Galaxy (M51). Photographed thru a Celestron C8, unguided. I spent some time adjusting the counterweights to find that sweet spot. Balance is very important. Sometimes, I like to go into the forum event posts just to read the awesome pony RP's. Fluffy Luna is Best Luna! I think a nice walk is in order before, ! sit down and start editing videos,returning phone calls, and emails, setting times for venders ...got to love being thrown in to a event but hey..its going to be fun and awesome Shout out to @MidnightFire1222 for this!! I'm off to work. I'll see you guys in 6 hours or so. Starlight is such a gorgeous mare! @Tacodidra suggested that I construct an MLP themed Perler creation, since I have been creating them from the MOTHER Trilogy as of lately. Since I have quite a bit of free time as of lately, I suppose I shall deliver. Full credit to Mega-Poneo for the sprite inspiration.